The 2 Days package to Meteora by train is organised daily. METEORA are listed as UNESCO World Heritage monuments. It’s a natural landmark nowhere to be found around the world. The imposing vertical rocks standing as pillars reaching the sky, host on their plateaus ancient monasteries with a vast cultural significance for the whole Christianity. The Byzantine Monasteries were built for protection at the top of the rocks. This is your chance to explore this unique natural phenomenon. The tour includes the train tickets, 1 night stay, Sunset, Morning, or Hiking Tour! In kalambaka join the 4.00 hrs tour of Meteora, see all 6 monasteries of the monastic community and visit 2 of them and experience the life of the monks and nuns. You deposit 40.00 € to help us buy your train tickets and you collect tickets and vouchers in Athens. * Be at the Railway Station of Athens (Larissa station) at 07:50. Find you platform and board the train to Kalambaka that departs at 08:20. Travel in a smooth and scenic ride through the plain of Thessaly. It is the most comfortable and efficient way. * You arrive in kalambaka at +/- 13:40 and an unforgetable experience starts. Enjoy the trip. Meet our driver and go to the hotel. Check in and have lunch in a nearby restaurant. * Return to the hotel and 16:00 be ready in the lobby of the hotel for the “afternoon sunset tour”. (CLICK and read details of the tour). (The pick up time for the “sunset tour” varies, following the time that the sun sets). * Return to Kalambaka after the sunset, have dinner in one of the tavernas and spend the night in the hotel KOSTA FAMISSI. * 13.30 – return to Kalampaka. Have lunch, and return to the hotel to take your luggage and walk 400 m. to the train station. * 17.20 – Board the train and at 17:32 depart for Athens. Arrival at Larissa Rail station at +/- 22.40. End of the tour. On day 2 you can choose to take the hiking tour to the Meteora rocks instead of the morning tour. This decision is yours. on the second day,either the 4 hrs morning tour, or, the hiking tour, organized by our local partner. Click here and see the terms and conditions to make a booking. Pay 40.00 € and secure your bookings. 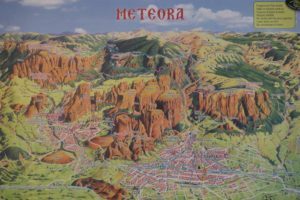 CLICK and see all the options to visit Meteora in guided tours or independent trips. You choose the monasteries to visit and how long to stay in each one. Question: Is it possible to visit Meteora, see the monasteries, and return to Athens all in one day? The answer is: Yes. In Kalambaka you have 3 hours to drive on the rocks and visit 2-3 monasteries at the maximum. If your visit to Greece is too short, this is your chance to visit Meteora. You realize why the first hermits chose this location to create their monastic community and seek communication with God. See the 4 monasteries and the 2 nunneries, and visit two of them. Learn about the everyday life of the monks, admire their architecture and gaze at the priceless relics and treasures of the monasteries, a cultural heritage to all Christian religions. * You collect your tickets from us and settle the account, at least a day before departure. * Be at the LARISA railway station in Athens at least 30 minutes before the train departure. * Find platform 8. Your train comes at 08:10 am. The difficult thing is to find your seat. * 08:20 – The train departs and following a scenic route it travels straight from Athens to Kalampaka(last stop). * 13:30 – Arrive in Kalampaka and meet our English speaking driver outside the railway station. * 13:45 – Drive to Meteora. Visit up to 3 monasteries. See old hermitages and cloisters in the caves. * 16:45 – Return to Kalampaka. Stop at a local restaurant for a light meal (not included in the price). * 17:30 – The train departs from Kalampaka and arrives in Athens (LARISA station) at +/- 22.45. To make a booking you deposit 40.00 euro per person and you settle the balance when we meet in Athens. CANCELLATION POLICY: 15.00 € p.p. is not refundable. In case of a strike the full amount is refunded. The price for the 3.30 hours private tour of Meteora includes your return B class train ticket and the taxi hire from the moment that you arrive until the moment that you tell the driver that you have seen enough and want to get back to Kalambaka and have something to eat. – 1 passenger: Train ticket (B class), 86.00 € p.p. – 1 passenger: Train ticket (A class), 98.00 € p.p. – 2 passengers: Train ticket (B class), 82.00 € p.p. – 2 passengers: Train ticket (A class), 94.00 € p.p. – 3 passengers: Train ticket (B class), 76.00 € p.p. – 3 passengers: Train ticket (A class), 88.00 € p.p. – 4 passengers: Train ticket (B class), 69.00 € p.p. – 4 passengers: Train ticket (A class), 81.00 € p.p. To secure your booking, please, click and see the terms, find the pay on line link in the footer, and, deposit 40.00 € p.p. * Return train ticket. Pay 12.00 euro, and upgrade the train ticket to A class (recommended). * Upon arrival you meet our taxi driver and for 3 hours, you visit up to 3 monasteries. * Visit hidden beauties & explore the area with a local, English speaking taxi driver. * No professional tour guide service is included. It’s you and the taxi driver. * Your lunch and drinks in the train and while you are in Kalampaka. Our BEST SELLER is the 3 days/2 nights Meteora and Delphi, independent trip by train/taxi and bus. We also offer packages for 2 or 3 days. During the extra day, join a Hiking Tour and explore the natural beauty. Discover the geology of the region and follow the trails that the first monks used centuries ago. Hike on the well paved paths from the monastery of Grand Meteoron or the monastery of Varlaam all the way to the village of Kastraki and Kalambaka. If the hiking tour is a difficult exercise, join the 4 hour morning tour and learn about the monasticism at Meteora. Discover their cultural wealth and have a personal experience of the monastic community. Last minute bookings are difficult to work. Plan in advance and get the best seats in the train. I booked a tour to Meteora via train with Astoria travel at a significant discount from other agencies. Kosta also picked us up from the cruise port and took us to our Airbnb. He also gave us lots of advice about life in Greece. He knows so much! And he truly loves his job and he is proud of his country. I hope that lots of people use his services! I did not feel that he was exploiting tourist dollars, like most guys did. He is honest and reliable. Travelling to Meteora by train is a comfortable and efficient way. A smooth and scenic ride. 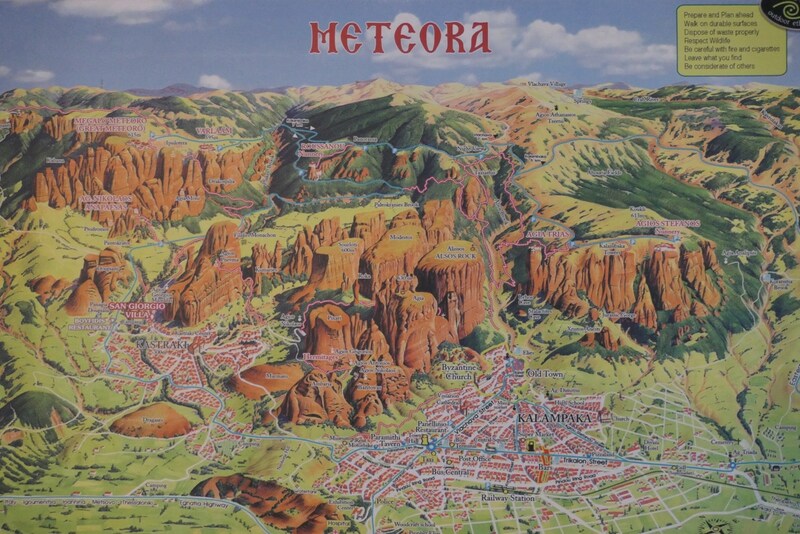 CLICK AND SEE ALL THE TOURS AND OPTIONS to visit Meteora. The 2 Days package to Meteora by train is your chance to explore a unique natural phenomenon in central Greece. The rocky forest with the Byzantine Monasteries, built for protection at the top of the rocks, are listed as UNESCO World Heritage monuments. The tour includes the train tickets, and 1 night stay with breakfast in the 3 star hotel Kosta Famissi. After checking in the hotel, you can explore Kalampaka. Don’t miss the 9th c church about 15 min. walk from the hotel. Day 1: Travel by train to Kalampaka, and visit the Meteora rocks in the afternoon. * Be at LARISA railway station 07:50, and find platform 08. * 08:20 – The train departs from Athens straight to Kalampaka (+/- 12 stops). * +/- 13:40 – Arrive in Kalambaka and check in the hotel KOSTA FAMISSI. * 18:00 – Return to Kalampaka. Evening free. Day 2: A day to explore Meteora before returning to Athens. * 09:00 – Take the bus or our taxi and visit the highest monastery open on the day of your visit. * 13:00 – After you finish your visits, hike down on the well paved paths, or, take the bus to Kalampaka. walk to the railway station. * 05.30pm – Board the train and depart for Athens. Arrival +/- 22.40. Daily departures travelling on your own or in a small group. Traveling by train is by far the most efficient and scenic way. You will go to secret local spots that the vast majority of other travellers will never experience. You will learn about the history of the place from a local tour leader. To secure your booking, please, read the terms and conditions and deposit 40.00 € p.p. TO MAKE AND SECURE A BOOKING You deposit 40.00 € to help us buy your train tickets. You collect tickets and vouchers, any day before your departure for Kalambaka. An important monument of Kalambaka is the byzantine church Assumption of the Virgin Mary, Basilica style. It is located at the base of the Meteora rocks in the old city of Kalambaka. For a very long time it was the main church of Kalambaka. This byzantine church is one of the oldest monuments in the province. The unique feature of the church is the large and tall pulpit found in the middle of the church. The oldest in Greece, possibly in the world, is the Prehistorical Cave at Theopetra dates 23.000 years old. A stone wall at the entrance of the cave blocks 2/3 of the opening. The cave is found about 5 Km from kalambaka. It is one of the most interesting Archaeological sites worth seeing in all of the Thessalian plain. It is of world-wide interest due to the discovery of rich and unique findings for two of the most important changes in human prehistory: the replacement of Neaderdal from the contempory human and the transition of the human hunter in the agricultural revolution. In small distance from the cave you can find the Documentation and education center of Theopetra cave. Includes: B class return train ticket + hotel in double room with breakfast. – 4.30 hours hiking tour of Meteora: 25.00 euro, per person. Your meals and drinks in the train & in Kalampaka. Travelling by train in a smooth and scenic train ride is the most comfortable & efficient way. Take this independent tour and visit the 2 well known UNESCO sites of Meteora, and Delphi, at your own pace. Travel from Athens and back in a combination of train, private taxi, and public bus. It took us a long time to make a team of partners and offer a reliable service at a reasonable price. Enjoy unique landscapes, and visit monuments of great historical importance. Join the local tours organised by our local partner a) the Meteora Sunset Tour, and b) either the morning Half-Day Tour or c) the Meteora Hiking Tour and learn the history and culture of the unique area of Meteora. Departures daily, travelling on your own or in small groups. 5 days guided classical tour of Greece staying an extra day in Kalambaka. Day 1. Travel from Athens to Kalampaka. In the afternoon, visit Meteora. * Be at the LARISA railway station at 07:50 and find your platform. * 08.20 – The train departs from Athens and travels straight to Kalampaka. * +/- 13.40 – Arrive in Kalambaka and check in the Hotel KOSTA FAMISSI. * 16.30 – Optional Sunset tour for extra 20.00 euro p.p..
* 20.30 – After dinner, return to the hotel for overnight. Day 2. Explore Meteora and at 17.30 depart for Delphi. * Wake up early go for a walk and experience the surrounding terrace, the flora and fauna of the area. * 08.00 – Have a good breakfast at Hotel Kosta Famissi. You will need a lot of energy this morning. have a light lunch, and return to the hotel to take your luggage and walk to the train station. * 17.20 – Get on board the train and travel to Levadia, via Tithorea. * 21.10 – Get off at Levadia, meet Apollo, our driver, and drive to Delphi. * 22.00 – Arrive in Delphi and check in the Hotel LEFAS. Day 3. In the morning, explore Delphi and return to Athens. * 08.00 – After breakfast walk to the bus ticket office and validate your bus ticket. * 08.30 – Visit the nearby archaeological museum. * 11.00 – Explore the sanctuary of Apollo, and the temple of Athena Pronaia. * 13.30 – Return to the town of modern Delphi and have lunch. * 16.00 – Board the bus and depart for Athens. Arrive in Athens at +/- 19.15. (Liossion street terminal). To secure a booking, please, read the terms and conditions and deposit 40.00 € p.p. Our price is: € 138.00, per person in double rooms. (The trip is not organized for single travellers). # The € 3.00 p.p. to each monastery, and the entrance to the museum and site of Delphi. # All meals and drinks, except the 2 breakfasts. # Services of a professional tour guide can be arranged at extra cost. The tours in Kalampaka are optional and are offered, at discounted rates. # Extra night in double bedroom: € 24.00 p.p., per hotel. (The trip is not organized for single travellers). # 3.30 hours Sunset tour of Meteora:Only 20.00 € p.p. # 4 hours morning hiking tour: Only 20.00 € p.p. CLICK and see all the options to visit Meteora, guided tours and independent trips. I booked 2 trips, One day Mycenae-Nafplion-Epidaurus and the 3 DAYS/2 NIGHTS – METEORA & DELPHI TRIP (no guide), from Astoria travel and was very satisfied with their service. Kosta, a very reliable gentleman, tried his best to arrange every detail for our trips. He accompanied us until we seated on the train at departure. He booked the same seat number for our departure and return train for us to be convenient to remember. Important is that I don’t think I paid more for this 5 star service. I paid less for the one day tour and for the train ticket comparing with what others paid. I highly recommend Astoria travel for Greece travel. In the footer of this website you find the “4 steps to make a booking”. If our offer sounds interesting, please, send us the booking form. The Grand Meteoro monastery. The highest and biggest of the six monasteries open to the public. If you have two days to spare this is one of the most impressive places you will ever visit. Meteora is a flat plain where God in his great wisdom placed these giant rocks where monks could climb to the top to escape the world. 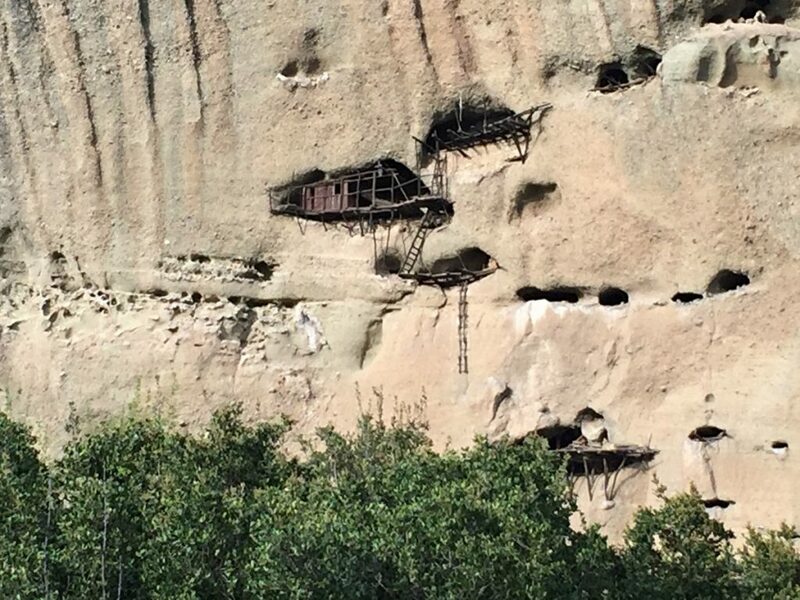 These monks built impressive monasteries, some which could only be reached by ropes and pulleys, built and supplied by hauling material up in baskets. Today, Meteora, is one of the top tourist destinations in Greece. Doing a Delphi-Meteora trip is one of the most popular journeys. Spectacularly perched atop rocky pinnacles in Thessaly, the Meteora monasteries are among the most striking sights in Greece. The name Meteora (Μετεωρα) is Greek for “suspended in the air,” which perfectly describes these six remarkable Greek Orthodox monasteries. The sandstone peaks were first inhabited by Byzantine hermits in the 11th century, who clambered up the rocks to be alone with God. The present monasteries were built in the 14th and 15th centuries during a time of instability and revival of the hermit ideal; the first was Great Meteoron (c.1340) and there were 24 monasteries by 1500. They flourished until the 17th century but only six survive today; four of these still host monastic communities. The nearest major town is Kalambaka (from the Turkish word for “pinnacle”), at the base of the Meteora, which has accommodation for overnight visitors as well as some medieval churches. Neighboring Kastraki has some accommodation as well. Alternatively, a guided day tour from Athens is a popular and easy way to visit. To visit all six in one day without joining a tour, begin with Ayiou Nikolaou Anapavsa, Varlaam and Great Meteoron before 1pm, break for lunch while the monasteries are closed, then see Roussanou, Ayias Triadhos and Ayiou Stefanou in the afternoon. A strict dress code is enforced: all shoulders must be covered, men must wear long trousers and women must wear long skirts. The Meteora are included in the UNESCO World Heritage List. Six monasteries, open to the public today, built on natural sandstone rocks, over the town of Kalambaka. The 64 gigantic rocks, made of conglomerate, create a spectacle, unique worldwide. There are several theories regarding the creation of these rocks. The prevailing theory is that one of the German geologist Philipson. According to Philipson, million of years ago the area was a huge lake and 3 rivers had their estuaries in this area. The rivers brought, stones and material, from central Europe. From the accumulation of these materials deltaic cones were formed. About 30 million years ago, after geological changes that took place, the central part of today’s Europe was lifted the Alpes and the valley of Tempi were formed and an outlet for these waters to the Aegean Sea was created. During the time of the alpine mountain orogenesie, solid volumes of “rocks” were cut off from the mountain chain of Pindus and as the centuries went by, the plain of the river of Pinios was formed between them. Orogenesis refers to severe structural deformation of the Earth’s crust due to the engagement of tectonic plates. The word “orogenesis” comes from the Greek (oros that means “mountain” and genesis for “creation” or “origin”). It is the mechanism by which mountains are built on continents. Orogenie develops while a continental plate is crumpled and thickened to form mountain ranges, and involve a great range of geological processes collectively called orogenesis. Following the continuous corrosion by the wind, rain and other geological changes these rocks took their present form. A spectacle “unique” worldwide. At the cavities, fissures and peaks of these rock towers people found protection from enemies that invaded from time to time the area. Some of these rocks reach 1800 ft or 550m above the plain. This great height, combined with the sheerness of the cliff walls, kept away all but the most determined visitors. Hermits and anchorites found shelter on these rocks, seeking mental calmness and tranquillity, while praying and seeking for Christian perfection. According to the existing scripts monk hood is present from the 1st millennium. Initially the hermits were isolated, meeting on Sundays and special days to worship and pray not only for their salvation but also for the salvation of all people, in a small chapel that was built at the foot of a rock known as Doupiani. Their life was simple and the work hard. According to scripts, Barnabas, the monk who established the cloister of the Holy Ghost is mentioned as the first hermit at 950-970 AD, followed by the monk Andronikos from Crete, who established the cloister of the Transfiguration of Jesus in the early 1000 AD. Later and around 1150-1160 AD the Cloister of Doupiani was established. Except the aforementioned cloisters others also existed in several cavities around the rock of Doupiani. At the beginning of the 12th c. in the area of the Meteora a small ascetic state was formed, having as centre of worship the church of Mother of God extant until today at the north part of the rock of Doupiani. The hermits were flowing to this small church from their hermitages in order to perform their common worship, to discuss the several problems that concerned them and to ask for the help from other hermits in order to carry out the hard work. The leading man of the cloister of Doupiani had the title of the “first”. Almost 200 years later, in the middle of the 14th c. the Monastery of the Transfiguration of Jesus on the mount was established by Holy Athanassios, who gave the big rock the name Meteoro. Since then all the rocks have this name. 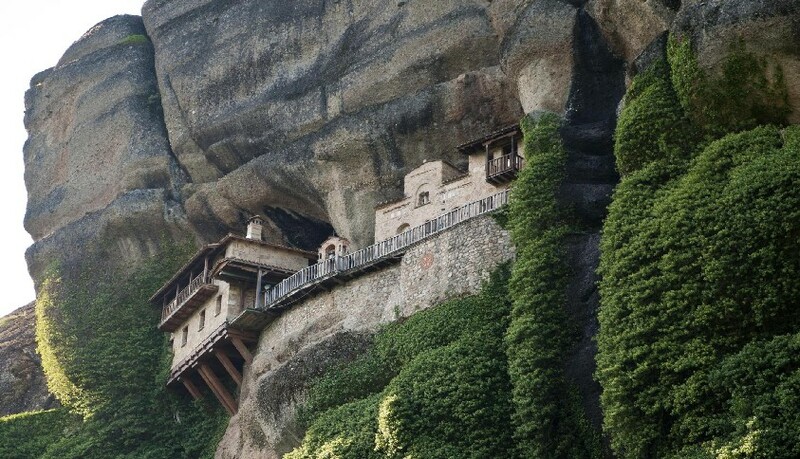 During the 14th and 15th c. a time of great prosperity for the monk hood in the Meteora we have the creation of many more Monasteries and their number reaches 24. In the middle of the 14th c. monk Neilos, founded the Holy Monastery of Ascension (the Holy Monastery of Ypapanti-Candle Mass, today), and in 1517, Nectarios and Theophanes built the monastery of Varlaam, which was reputed to house the finger of St John and the shoulder blade of St Andrew. Access to the monasteries was deliberately difficult. The first hermits climbed up the rocks using scaffolds wedged in holes of the rocks. They felt safe from political upheaval and had complete control of the entry to the monastery. Later on, the only means of reaching the monasteries was by climbing ropes, windlass and long ladders, which were drawn up whenever the monks felt threatened. The monastery of Varlaam has an extensive net and pulley system, from which rope nets are let down several hundred feet by a windlass, today used for lifting up provisions. The ropes were replaced, as the monks say, only “when the Lord let them break”. In the 1920s the first steps were carved in the rocks. There is a common belief that St. Athanasius (founder of the first monastery) did not scale the rock, but was carried there by an eagle. As years went by, under several difficulties, conquerors of the area, thieves’ raids and other factors, many of the flourishing Monasteries were abandoned (period of decline after the 17th c) and during World War II the site was bombed and many art treasures were stolen by the Germans. Today, the tradition continues for over 600 years, uninterrupted in 6 monasteries, 4 inhabited by monks and 2 by nuns. According to popularity they are: the Monastery of the Great Meteoro, the Varlaam Monastery, the St Stephen Monastery, the Holy Trinity Monastery, the St Nicolas Anapafsas Monastery and the Roussanou Monastery. Each of them has fewer than 10 inhabitants. 2) Of Ypapanti-Candle Mass (dependent on the monastery of the Transfiguration or Great Meteoro). We feel that the Meteora belong to everybody. This is your chance to see the “unique” spectacle and visit the monasteries.